In this recipe natural and baker’s yeast are used in combination. 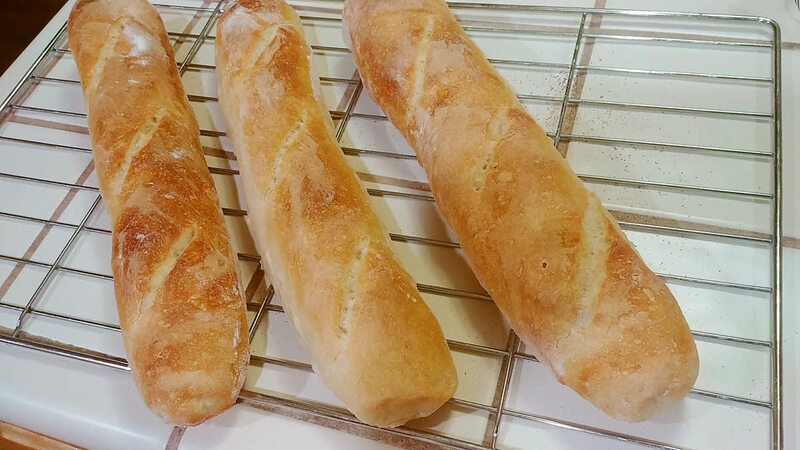 Baker’s yeast gives baguettes the lightness while natural yeast with gentle mixing and long and slow rising at every stage develops a good flavor. To make poolish, in a bowl mix poolish ingredients and let it rest for 3 to 4 hours at about 75 to 80 degrees F or overnight in refrigerator. To make the leaven, mix all the leaven ingredients thoroughly so that no dry flour remains. Let is rest for 3 to 4 hours at about 80 degrees F.
When both poolish and leaven pass the float test (drop a spoonful of batter in water, if it floats, it is ready) they are both ready otherwise wait for more time. To prepare the baguette dough, mix 200 gm leaven and 200 gm poolish in 250 gm warm water. Whisk it thoroughly so that they mix up properly. Now add both the flours and mix it with your hand so that no dry flour remains. Cover and rest for 40 minutes. Don’t skip this step. This is to autolyse the dough. While resting, glutens swell and form chains that become the gas trapping structure of the dough. Autolyse improves the effectiveness of the time spent mixing while shortening the time needed to actively develop the dough. After the resting period, fold the dough and transfer in a bowl that is a poor conductor to maintain the warm temperature. Dough will now begin to rise. This is called bulk fermentation. The primary purpose of this step is to develop the flavor and the strength in the dough. This step is highly temperature sensitive. The dough should be kept at temperature between 78 to 82 F to accomplish full bulk rise in 2.5 to 3 hours. To fold, dip your hand in water to prevent sticking and grab the underside of the dough, stretch it up and fold it back over the rest of the dough. Turn the bowl 90 degrees and repeat the fold. Do this total 4 times. After the first fold, mix the salt in 10 gm of warm water and add to the dough. Incorporate both in dough by squeezing the dough between your fingers. For the next 3 hours, fold the dough 4 times every 30 minutes. The dough development that bakers usually achieve by kneading is accomplished here by folding the dough with much less work. By the end of 3 hours, the dough will feel aerated and softer. A well developed dough is more cohesive and releases from the sides of the bowl when you do the turns. You will see 50% increase in volume. More air bubbles will form along the sides of the container. Now the dough is ready to be shaped. Flour the work space lighly and bring out the dough. Divide the dough in as many baguettes that you want to make. For each blob, gently push the sides under using the bench knife or pastry scraper and make a round dough using as little flour as possible and a good surface tension. Repeat with each portion. Leave the dough to rest on the work surface for about 30 minutes. This stage is called bench rest. Cover the dough so that it does not dry up. The dough will spread like a pancake. To give the final shape, first place a kitchen towel big enough to hold all the baguettes. Dust it generously with rice flour. Keep aside. Working with one dough at a time, fold the third of the dough closest to you up and over the middle third. Holding the ends of the dough, stretch it horizontally so that it doubles in width. Fold the third of the dough farthest from you over the middle of the elongated rectangle as if closing the flap of an envelope. Press on this flap to develop tension in the dough. Roll the dough towards you pressing with your palms and fingers to develop further tension. You will end up with a big roll. Roll it back and forth to get the right and even size while keeping in mind your baking stone length. Place it gently on the kitchen towel. Separate the loaves with folds in the towel and cover with more towels. Let them rise at about 75 degrees F for 2.5 to 3 hours. Place the baking stone in the oven and heat it up to 500 degrees F. Once it is hot, place a broiler tray with wet kitchen towel in the lower rack to generate steam. Wait for another 20 to 30 minutes for stone to heat up and oven to be steamed. Gently slash the baguettes in any way you like. Transfer them to the baking stone and pour another cup of hot water in the broiler tray. Reduce the oven temperature to 475 degrees F. Bake for about 15 minutes and then remove the broiler tray. Continue to bake for another 10 to 15 minutes until a deep golden color. Serve warm from the oven or let them cool on rack.